An upwind body drag. Photo supplied by New Wave Kiteboarding. In April, we discussed the wind window. It is important for a kiter to grasp the theory of the wind window and have the ability to comfortably navigate the kite around the edge of the window before learning to body drag. Body dragging is the act of powering the kite to propel the body through the water without a kiteboard. Body dragging, is a critical step in the learning process, as it can be used for both board retrieval and for navigating back to dry land if needed. The first form of body dragging we will discuss is known as upwind body dragging. This is mainly used for board recovery. Typically, after a fall/wipeout, a kiter will be dragged out of reach and downwind of their board. Trying to swim upwind toward the board can be time consuming, exhausting, and in big swell, dangerous. The kiter must maneuver the kite to sail back upwind to their board. This is done by keeping the kite at the 1:30 or 10:30 clock position. The kiter will then lay on their side and form a semi rigid, yet hydrodynamic body position. The kiter will then point themselves 15 to 20 degrees upwind of the kite. Basically, the kiter becomes a sailboat keel and uses their hands and legs like a rudder to steer themselves at the appropriate angle. They will then tack back and forth until they have gone upwind enough to intersect their board. The next thing a kiter will learn is how to body drag down wind. This is a very useful tool for getting back to the beach quickly if you lose your board and are unable to retrieve it. However, the main purpose of this exercise is to teach the kiter how to perform a proper power stroke. As discussed in our last article, the power stroke is what actually provides the initial lift/pull that gets the kiter up and riding. To practice this, the kiter will first lay on their belly facing downwind with the kite at 12:00. 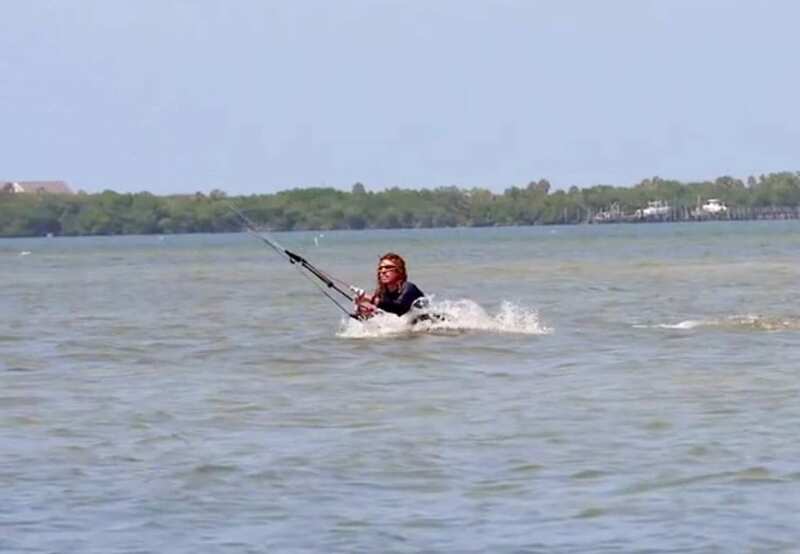 If the kiter wants to simulate riding to the right, they will dive the kite from 12:00 to 1:00 and then back again while allowing the kite to drag them through the water. The kite’s flight pattern should resemble a “figure eight.” As the kiter becomes more comfortable they will gradually dive the kite deeper into the window. Therefore, if the kiter wanted to simulate riding to the left, the power strokes would then be performed on the left side of the window. We have now discussed all of the disciplines leading up to our first ride on the board. I am already excited for next month when we get to put everything we have discussed to the test and conquer the board! As always, remember nothing can replace training with a professional instructor and no one should ever attempt to kiteboard without taking proper lessons.